Late of Heritage Lodge, Murwillumbah. Passed away peacefully on Friday 25th January 2019. Dearly loved Wife of Toby (dec’d). Loved Mother and Mother-in-law of Vivian (dec'd) & Joan, Ian & Diane, Anne (dec'd), Geoffrey & Glenda, Jeanette & Doug Breckenridge. Loved Sister of Glady, Jessie, Linda, Dulcie, Nita, Marion, and Jack (all dec'd). 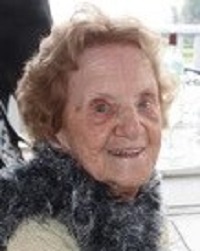 Family and Friends are warmly invited to attend Elsie’s Funeral Service to be held at the Sacred Heart Catholic Church, Murwillumbah, on Monday 4th February, 2019, at 11.00 am (NSW). After the service, the cortege will leave for the Murwillumbah Lawn Cemetery.